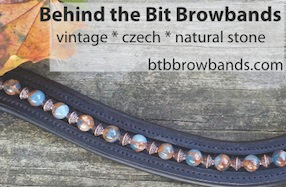 Behind the Bit: The hunter ring: "Just a beauty contest"? The hunter ring: "Just a beauty contest"? Perhaps. But when I watch videos like this one -- John French and Rumba -- I think "what's wrong with seeing something beautiful?" What a gorgeous horse. Incidentally, I think Stephen Spielberg bought this horse for his daughter to show in Children's Hunters. Disclaimer: this isn't a regular hunter show round, it's a derby, so there is a bit more to the course than a a standard hunter round. But you get the point. Well now. Yes, hunters are about beauty, but there's a lot that goes into a good round. The rider needs to be super accurate about distances and strides to make the round look soft and even all the way around. This horse is really tight with his knees and front end which adds to the picture as does his bascule over the jump. But...I'm not too keen about his landings. He never stretches his nose out and almost appears to land unbalanced on his forehand...because....I suspect from watching...that he has been working in draw reins or some kind of bitting rig that has denied him the right or ability to poke his nose out at all. You can see on some of the turns how he shakes his head against the rider's hand, mostly because he is not fully balanced on to his hind end. That's how it looks to me. Those landings are not exactly what I call pretty, but in the hunter arena, lots of times that doesn't matter as the jump is what really counts. Yes indeed, a beautiful horse and a well placed round, but I am suspicious.....I would like to see that horse dare to put his nose out a bit on the landing side to match the stretch in the jump itself. I thought the derbies were created and promoted precisely because of criticisms that hunters had become too artificial / had gone too far from their roots / were too much of a beauty contest. I just find the use of a derby round to suggest that it's ok for hunters to be a beauty contest odd. It's so counter to everything that the derby courses are supposed to be promoting. I guess I don't see that Rumba's talent as a derby horse proves that it's ok for the regular hunter divisions to be beauty contests. To me, it highlights the issue and proves just how much better the hunters could be / used to be. Hi Halt Near X, I specifically wanted to use Rumba as an example b/c he is so spectacular -- and most of the video footage is of derbies. I wrote an article on derbies a while ago so I'm somewhat familar with their purpose. The choice of video had more to do with the animal i wanted to feature than the type of competition. You can see the same horse do a mediocre round with a young rider if you go to YOutube. I chose to give that one a pass, just b/c the derby was a better round. Shrug. This really was a beautiful round -- I've watched it so many times! Maybe the hunters are a beauty contest, but that's okay with me. I am more than happy to appreciate them for their beauty and do my best to compete! There are people who do things I don't agree with, of course, but from what I can tell, you find that in every discipline. I too am a hunter rider. Would like to thank Stacey for posting such a beautiful round. Jean, not all hunters are put in rigs and draw reins. They are schooled and muscled up just as well as any top Grand Prix dressage horse. Compare his round to any top horse in the latest derby finals on equestrian tv. If he was landing unbalanced he would not jump the way he does, nor would he have placed as well as he did. Sorry guys, I will stand by my assessment. And here is why. I rode hunters for well over 15 years and competed in Amateur Owner in recognized shows. So I am not speaking as a dressage rider with no background. I totally agree about the amount of training it requires to make a good hunter and how much skill it takes to create a good ride. Watch this horse's reaction to the rein/bit carefully on the landings, turns, and the halt before the walk through. To me, there is very little difference between the expectation of a horse's response to the bit in a good dressage test and a good hunter test. The basic flat training is the same. That is what dressage is all about. What I do not see in this round is a consistent softness to the bit after the fences. Sorry. Not to take away from the horse's quality or beauty, but it bothers me. Lovely horse and a beautiful course - a real pleasure to watch. I disagree that a hunter horse is muscled and fine tuned to the level of a Grand Prix Dressage horse. Hunters never have to deal with the level of collection even a Jumper will see, and through all my years of A circuit riding, the saying always was "a hunter doesn't need to be worked as much". I feel that hunter is such a money game. The amount of skill required in the "top" level doesn't equal that of Jumpers, Dressage or Eventing. The Derby is a start, but why not just do a good Derby jumper course? It's still going to be infinitely more challenging, and still draw more people to come watch. The fact is that Hunters was meant to be more of like a breed show-- you show off your horse's suitability for the field. Yet what's winning in the hunter world these days are not what you see at a hunt. I accept that all disciplines have strayed in some way from their original purpose, but in lieu of that the other sports have at least upped the ante in terms of technical challenge and finesse. While I, personally, don't enjoy the look so much, there's a lot to be said positively for hunters. As in all other disciplines, done poorly it can be ugly. However, the ability to keep a horse calm and steady, keep turns balanced, generally land on the desired lead or at least show clean changes, get distance - every distance, etc., are all things which take skills riders in other disciplines often lack. I did hunters in the past, and it wasn't the fit for me, but I sure appreciate all there is to learn out there! Rumba is a spectacular hunter, with a fantastic jump. At the Thermal Hunter Derby he earned a 92 plus 8 bonus points for handiness = 101!!! I think he was The Chronicle's Show Hunter Horse Of The Year.